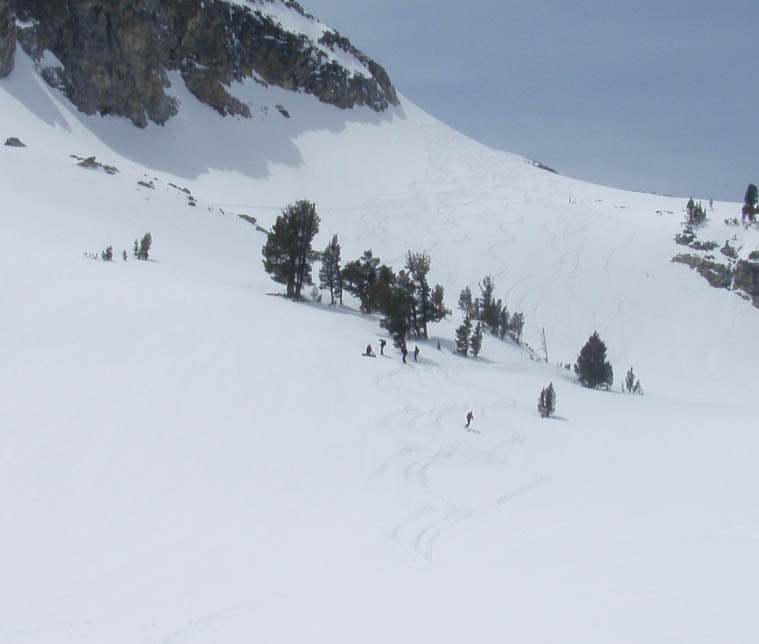 After the success of last years ski mountaineering course and a feature in “Backcountry Magazine” we quickly filled up 2 courses for this spring. Our first Course was full with nine participants from the Sun Valley area and Boise. The diverse group had everything from ex-dead heads, a physical trainer, tech engineers and a coulpe high schoolers who could hold their own. However, they all shared the common passion for skiing/snowboarding and the goal to learn more about steep skiing and mountaineering. This diverse crew of backountry skiers and riders was joined by SMG course leader Kirk Bachman, ski mountain guide Michael Hatch, and SMG’s finest Chute Snowboard Patroller, Clark Corey. The weather looked grim from the start with warm temps in the forecast. Fortunately the forecast was off and instead we received 5” new on the first night and a combination of cold nights and sunny days made for awesome alpine corn skiing. The group was feeling the ‘Stoke’ of the Sawtooth Alpine terrain which was accessed from the Williams Peak hut. So here’s a few fotos from Kirk’s camera along with Clark’s. Send us yours and we’ll post!